For the past month or so I have been gathering and testing recipes for a new breakfast breads class. Two of the recipes have already appeared here—Everyday Blueberry Muffins and Fresh Fruit Scones (in class I made these with frozen raspberries and chocolate chips). But the other recipes were pretty much all new to me. 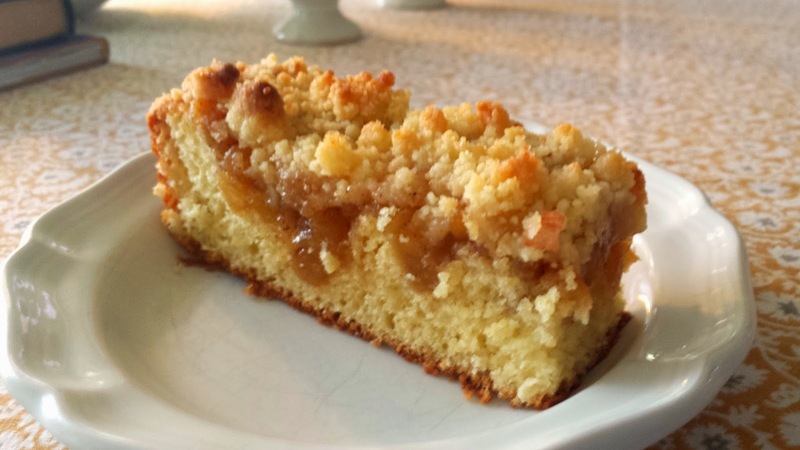 As much as I love the muffins and the scones, my favorite thing in this class turned out to be a German-inspired, yeasted coffee cake topped with apples and a simple streusel. It is a very different cake from the typical butter cake base that Americans associate with streusel coffee cakes. 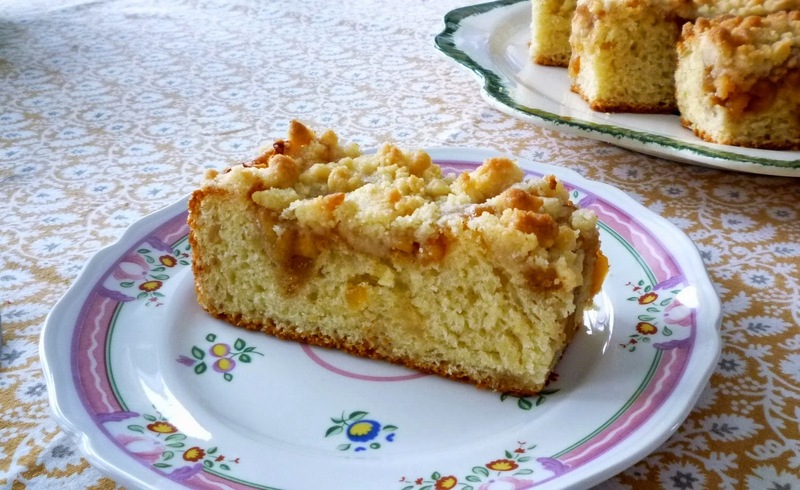 Whereas a butter cake is rich, sweet and fine-grained, this kuchen is light and slightly porous with a complexity of flavor that can only be found in yeast-leavened baked goods. And while it is definitely a sweet cake, it is much less sweet than its American counterparts. I find it to be addictively delicious. The inclusion of this particular cake in my class came about as I was thinking about a coffee cake my mother made a few times for our Christmas breakfast when I was a kid. I remembered it as being much less sweet than the kinds of things that kids (at least the kids in our house) like to eat for Christmas breakfast. And this may be why she eventually replaced it with a sour cherry coffee cake. As I prepared for my class, I wanted to revisit this cake….firstly because, being yeast-raised, it was a bit different, and secondly, I wanted to re-experience it with my adult taste buds. Once the recipe was located, I was struck by its extreme simplicity. It really seemed a bit too simple to teach. Not that there is anything wrong with simplicity—there just isn’t much to “show” during a demonstration. The dough is mixed entirely in the machine in what is pretty much one step and the fully risen cake is simply drizzled with a mixture of cream, cinnamon and brown sugar right before baking. Delicious?…yes. Material appropriate for a cooking demonstration?…not really. But looking at this cake got me to thinking about this interesting class of yeast-raised coffee cakes from Germany. The cake portion is almost always the same….it is the topping that varies from cake to cake and cook to cook. Kuchens are often topped with raw fruit (halved, ripe prune plums…thinly sliced apples…) or with a cooked fruit compote. Both of these can be topped with a simple streusel…and the raw fruit versions are frequently just given a swab of melted butter and a generous sprinkling of sugar. Sometimes the cake topping doesn’t include any fruit at all… just a streusel (streuselkuchen)… or butter and sugar (zuckerkuchen...my mother's cake is most likely a version of this one). There are probably as many permutations of toppings as there are German grandmothers. After examining several, I decided that this really was the cake I wanted to teach. By adding an apple compote and a streusel, the cake suddenly acquired some cooking demonstration-worthy possibilities. With the wide variation in toppings, it was surprising how little variation I found in the base cake recipes. The ingredients….even the quantities of ingredients…were remarkably similar from recipe to recipe. Most were simple straight doughs (everything is mixed together, kneaded until smooth and elastic and then set to rise). Some recipes added a cold overnight rise in the fridge. Two cake recipes stood out to me. My mother’s, and another that I found on line. The one on line was based on a prized, old family recipe. Both of the recipes use the identical...and unusual...mixing method. I was intrigued enough by the method that I decided to give this version of the cake a try. I liked the result so much that I stayed with the method…even though I didn’t really understand it at first. 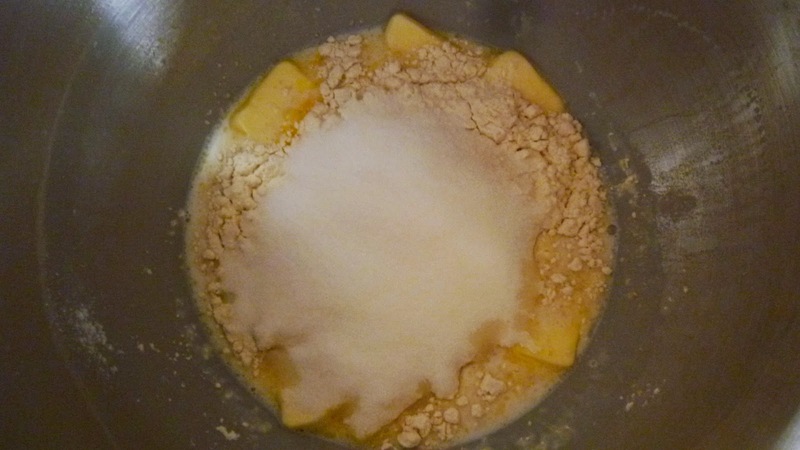 The mixing method shared by these two versions of the kuchen is as follows: Half of the flour is set aside. The remaining half is combined with all of the other ingredients (milk, yeast, butter, eggs, sugar, and salt) in the bowl of an electric mixer. The ingredients are mixed on low speed until everything is moistened. Then, the dough (more of a batter, really) is beat at high speed for three minutes. The reserved flour is added and stirred in by hand just until it has been absorbed—my mother’s recipe goes so far as to explicitly tell you not to knead. I originally went with this method because I was curious about it. And as I said, I was super impressed with the result, so I have stuck with it. In making the cake over and over, the method has begun to make sense to me. Most of the recipes treat the dough as if it were truly a bread…mixing and kneading to create good gluten development. But of course, the goal isn’t bread…it is cake. The method I chose to use treats the dough like a cake batter. The dough/batter is aerated first (the initial batter lightens in color and becomes fluffy….somewhat like a traditional creaming-method butter cake batter). The bubbles created by this aeration will be inflated by gases produced by the action of the yeast—just like the bubbles in the batter of a well-aerated butter cake are inflated by the reaction of a chemical leavener—causing the cake to rise. And, just as with a traditional butter cake, the flour is folded in at the end—stirring only until it is absorbed—since over mixing at this point will produce too much gluten development….which would in turn toughen the cake. As long as you remember you are making cake—not bread—the method makes perfect sense. I should mention that I have included the overnight rise in the fridge in my version of this cake. One reason for this is that during its stay in the fridge, the flour becomes fully hydrated, making the final dough very easy to manipulate. More importantly, the long cool rise encourages wonderfully complex flavor development. The incomparable flavor that results is totally worth any extra planning that you have to do to fit this cake into your schedule. But to me, this overnight rise makes this cake more—rather than less—convenient to prepare since everything can be made in advance. Simply make the compote and the streusel at the same time that you make the batter and then place everything in the refrigerator. In the morning, all you have to do is assemble and bake the cake. What more can you ask?…deliciousness and convenience…..the perfect addition to your next weekend brunch. Place the warmed milk in the mixing bowl and sprinkle the yeast over; stir in. Add the butter, egg, yolk, half of the flour, sugar and salt. Using the paddle attachment, mix on low speed until all the ingredients are moistened. Increase the speed to medium-high (high if using a hand or old-fashioned double rotary electric mixer) and beat for 3 minutes. The batter will become lighter in color and will look smooth and creamy and slightly fluffy. Add the remaining flour and fold in just until the flour is absorbed. It is not necessary to beat the dough until it is smooth—it will look coarse and lumpy. Scrape the batter into a buttered bowl and use a spatula to turn to coat in the butter. Cover with plastic wrap and chill overnight (or up to 24 hours). and press into a square shape. Using a rolling pin, roll out until it is 1/2-inch thick and measures 9- by 9-inches. Transfer to the prepared pan and pat out, making sure it is pressed evenly into the pan. Cover with plastic wrap and set in a warm place until doubled—about 45 minutes to an hour. When the dough has risen, dimple deeply. Spread the apple compote evenly over the cake, coaxing some of the compote down into the holes created by the dimpling. Scatter the streusel evenly over all. Bake in a preheated 400° oven until the streusel is tinged with golden brown and the cake is springy, but firm, to the touch—about 25 to 30 minutes. An instant read thermometer plunged into the center of the cake will read about 185°. Place the cake pan on a wire rack and let cool for about 15 to 20 minutes. Turn the cake out of the pan and then invert so that it is streusel-side up. Serve warm. Makes 1 9-inch cake, serving 10 to 12. Add the sugar, cinnamon and zest. 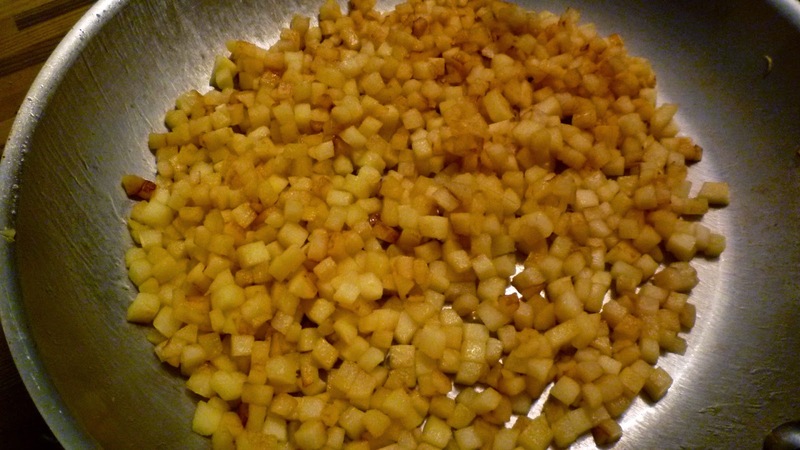 Toss and cook until the sugar melts and the apples are bubbling thickly—about a minute or two. Remove from the heat and cool. Cover and chill. Makes about 1 1/2 cups. Combine all the ingredients in a small bowl and chill until cold. The streusel will solidify when chilled. Break it up a bit with a fork or your hands before using. Remove the compote and the streusel from the fridge when you pull the dough out of the fridge so that they can both come to room temperature prior to being spread over the risen cake. This cake is best eaten warm, soon after it is baked. After that, cut the cake into portions, wrap individually and freeze. To reheat, remove a portion from the freezer and let thaw at room temperature (leave the wrapping on the cake)—this will only take an hour or so, but if I want a slice of this cake for breakfast, I set it on the counter before I go to bed. Unwrap the cake, place in the center of a square of lightly buttered foil and fold the foil around the cake, sealing tightly. Place in a warm (300° to 350°) oven for five minutes. Unwrap and serve warm. 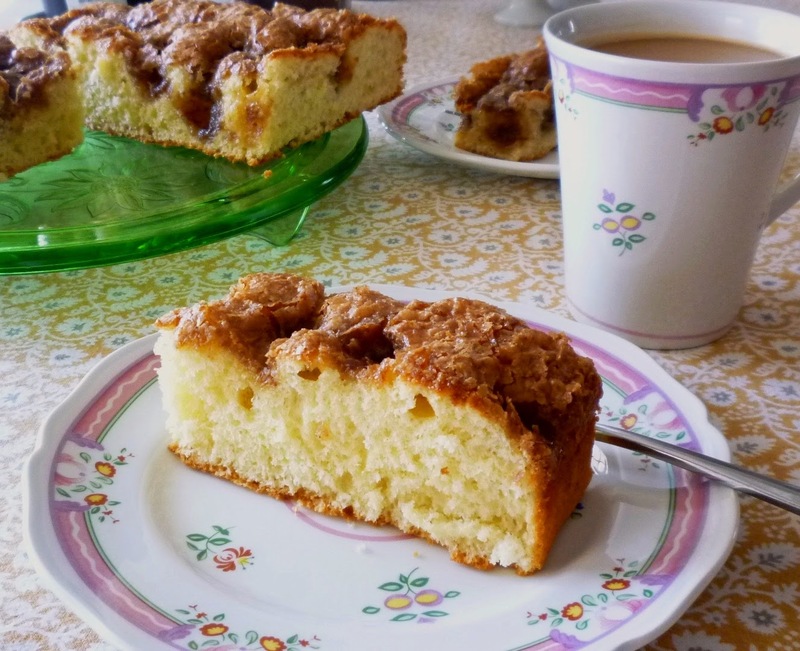 My mother’s version of the cake was called a “German Cinnamon Coffee Cake”. Her recipe was from the December 1973 issue of Better Homes & Gardens Magazine. 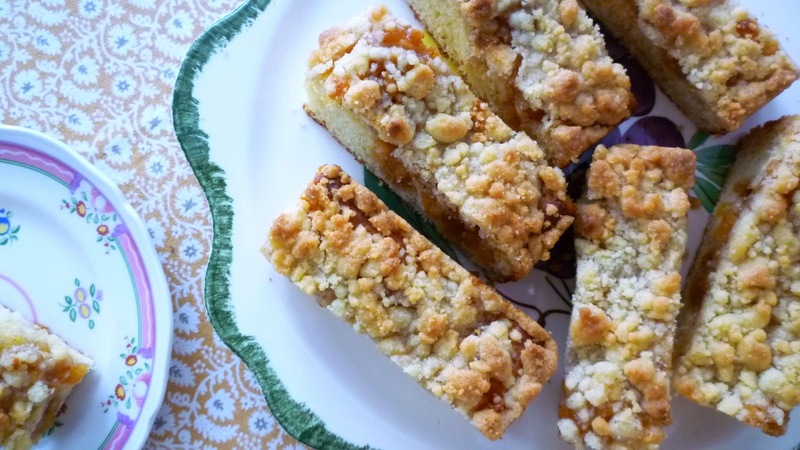 To make this cake, omit the apple compote and streusel. When the cake is fully risen, dimple evenly and deeply and pour a mixture of 2/3 c. (135 g.) packed brown sugar, 1/3 c. (80 g.) heavy cream and 3/4 t. cinnamon over the top, making sure all of the dimples are filled and spreading evenly. Bake for about 20 minutes. Cool for 10 minutes in the pan before turning out. Turn right side up and serve warm. 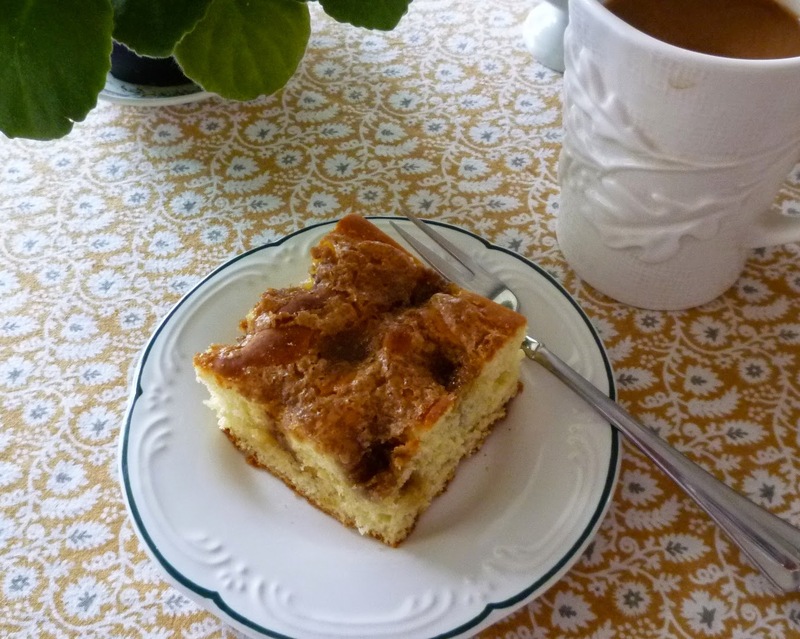 My recipe for the “cake” portion of this kuchen is a combination of the one my mother made and one from the blog “That Skinny Chick Can Bake”. Substitute 1 1/2 cups of any favorite thick fruit compote over the risen cake in place of the apple compote.